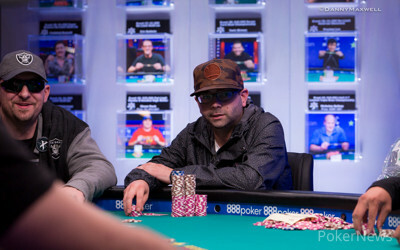 Canadian player Tim Andrew turned his first-ever bracelet event appearance into a golden debut. Andrew took down the 3,250-strong Event #11: $365 PLO GIANT for $117,024 and the WSOP title, putting his name on the poker map in a spectacular fashion. "It's a pretty good feeling," he said. Andrew's victory is phenomenal on multiple levels. He loves playing Pot-Limit Omaha but hardly plays tournaments. Originally from British Columbia, Andrew can be seen at cash game tables in Calgary. He revealed that his previous biggest tournament payday was only about $4,000 but now he's notched his first six-figure result. "I love playing poker," said Andrew. He recently switched from studying to fully concentrate on poker. Andrew's remarkable final table run started in a bizarre way. He wasn't at the table for the first 30 minutes or so. As it turned out, there was no other reason behind his late arrival than the simplest one; he overslept. "I woke up at 1:45pm and I was gonna leave right then but then I was just like 'you know what, I'm gonna miss some hands anyways.' So I just wanted to have a shower to at least feel good. I had a cold shower to clear my head," Andrew said. While he was on his way, the other players already battled on the stage in the Brasilia Room, and they fought hard. It could easily end with Andrew coming to the table with three seats already open, but the narrative was very different. The start-of-day chip leader Srinivas Balasubramanian would now perhaps wish to have had a longer sleep just as Andrew. Coming back with a full bag of chips and a direct position on the most dangerous player on the table, four-time bracelet winner Michael Mizrachi, Balasubramanian surely had high expectations for his final table campaign. But it turned out as a disastrous experience for Balasubramanian who had to lick his first wound when he got it in good against Kevin Nomberto on the turn with Nomberto drawing for only two outs to survive. Nomberto binked and started the giant downfall of Balasubramanian, who soon doubled James Sievers and then Mizrachi as well. So it was Balasubramanian leaving the finale in ninth place, much to the shock of everyone at the table, including Andrew who had taken his seat to witness Balasubramanian lose the rest of his chips. Andrew had a completely different gameplan than Balasubramanian. His strategy was to be as cautious as possible and don't get into some huge fireworks early on. "I didn't want to get clipped early. I tried to stay away from the big pots and win a lot of little pots," Andrew said, adding: "I didn't want to have to make big decisions where my whole stack would have to go in." Andrew managed to climb to the pole position and controlled a solid stack throughout. He was following his plan while Pete Arroyos and Mizrachi weren't scared to blast. Mizrachi vaulted to the lead at one point but just when he was getting to his typical mode of relentless piling, the fortune turned away from him. In what was the largest pot at the time, Arroyos shoved when "The Grinder" peeled double suited aces but the three-time Poker Players' Championship winner couldn't hold. Arroyos had only five outs on the turn and he received one of them, finishing with a set of kings. Mizrachi bounced back, scoring a double elimination of short stacks Sievers and Nomberto, but he was the next to go. Mizrachi's bid for the title ended when Arroyos hit an ace, cracking kings in a preflop contest to bust Mizrachi in fifth place. Arroyos was in possession of half of the chips in play and the fast structure left all his opponents short. Arroyos took care of Sandeep Pulusani and Robert Cicchelli who weren't able to sustain a decent stack. Only Andrew was controlling his belongings without major swings so he wasn't far behind Arroyos when they entered the heads-up match. Arroyos was, however, playing ultra-straightforward. He kept potting most of the streets, trying to finish the duel very quickly. He tackled Andrew close to 10 big blinds but Andrew made two big doubles in consecutive hands, completely changing the picture of the duel. The first all in saw Andrew get it in ahead and hold but Arroyos had him on the ropes right away when he flopped the middle set with jacks against Andrew's top pair and a nut flush draw. Andrew got there on the turn and a blank river gave him a commanding lead. Andrew eventually peeled aces and his hand prevailed against a wrap. While there are hundreds and thousands of players endlessly trying to capture their first gold, Andrew needed just one attempt to tick the ultimate poker achievement. "I played one deepstack with a $150 buy-in," Andrew said about his tournament résumé from this summer. Now with a confidence of a bracelet winner in combination with the large chunk of money in his pocket, the PLO world can only wait for what more can Andrew show in the last two weeks of the series. There's still a couple of PLO events on this year's schedule so stay tuned to PokerNews to find out if Andrew can make it two-for-two. Pete Arroyos Eliminated in 2nd Place ($72,606); Tim Andrew Wins the PLO GIANT ($117,024)! Pete Arroyos limped on the button, Tim Andrew raised the pot to 4,800,000, and Arroyos called. The flop came down , Andrew bet the pot, and Arroyos called all in for for 4,800,000 with for a wrap. Andrew held . The turn kept Andrew ahead and the river completed the board, no help to Arroyos, ending his tournament in second place for $71,703. Tim Andrew wins the PLO GIANT for $117,024! A recap of the event will be published later this evening. Pete Arroyos limped his button and Tim Andrew checked his option. They checked to the turn of a board where Andrew check-called 2,500,000 from Arroyos. Andrew tabled for a wheel, Arroyos mucked, and Andrew won the pot. Tim Andrew limped in the small blind and called when Pete Arroyos potted. 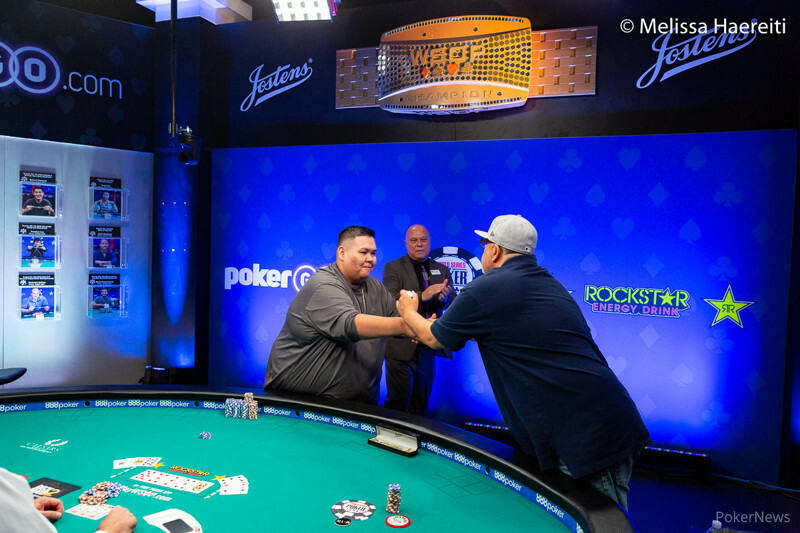 The flop landed on the felt and the chips were in within a few seconds as Arroyos checked, Andrew potted, and both players then once again announced a re-pot and all in to make things official. Andrew was behind with a top pair and the nut flush draw versus Arroyos' set, but he filled his draw right away as the appeared on the turn. "Pair the board!" Arroyos hoped but the river sealed a big double for Andrew. 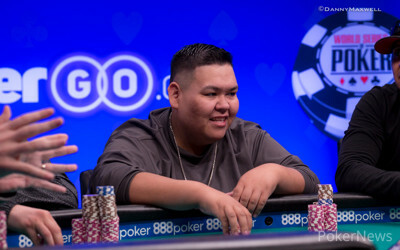 Pete Arroyos raised the pot to 4,800,000 and Tim Andrew called from the big blind. 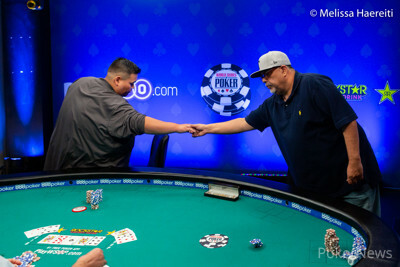 The flop came down and Andrew checked to Arroyos who bet the pot of 9,600,000. Andrew check-raised all in for 12,500,000 and Arroyos called. Andrew tabled leading Arroyos' . The turn and river completed the board, giving Andrew the bigger flush to double through Arroyos. 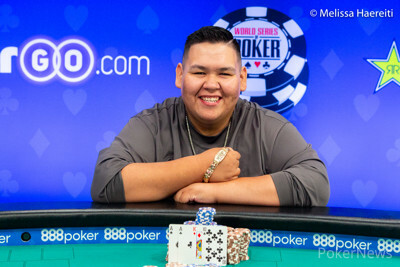 Tim Andrew raised to 4,300,000 and Pete Arroyos defended his big blind, calling. The flop of was checked and Arroyos checked the turn as well. Andrew tossed in a bet of 4,500,000 and Arroyos snap-raised to 10.5 million. Andrew was as fast with putting in calling chips and they continued to the river. Arroyos tapped and Andrew knuckled back. "Dammit," Arroyos said as he hoped to see his opponent fire. Arroyos flopped a full house with and Andrew flashed before he mucked his hand. Pete Arroyos limped from the small blind, Robert Cicchelli raised the pot to 4,800,000 from the big blind, and Arroyos called. Arroyos checked in the dark, the flop came down , and Cicchelli committed his remaining 3,500,000. Arroyos called with for a pair of eights, leading Cicchelli's . The turn and river completed the board, no help to Cicchelli, ending his tournament in third place.